During Christmas time a few years ago, Herberger’s had a great deal on a 2-quart Crock-Pot and I decided to get one. I thought it would be great to have a smaller one for smaller meals, and it was a great purchase. I’ve used it frequently. It has all of the features of larger models, including a removable insert, making it very versatile. So, while a larger Crock-Pot is slowly cooking a meat roast, this little workhorse can be warming up some soup for lunch! 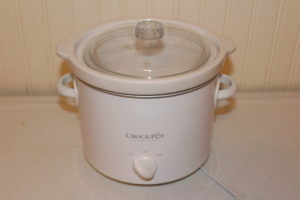 My 2-quart Crock-Pot. One of the best purchases ever!